Racing through Central Park after a pair of purse-snatchers, the two make it more of a “friendly competition” at first. Brandishing an umbrella, Casey takes out the first purse-snatcher. The second one draws a knife, but Raph dissuades his confidence with a glimpse of his sai. Casey then takes the distraction as an opportunity to lay the thug out with a lacrosse net (while screaming “SPOON!”). Raph and Casey then return the purse to the apartment of its owner, anonymously, and leave feeling pretty good about their night’s work. Bumping fists, they figure they’ll eventually see more of each other… little realizing just how much more of each other they’d end up seeing. At April’s apartment, Raph (with an eye-patch, fiddling with his Shredder helmet) and Casey argue over just who is telling the story correctly. Mike, Leo and Don (who is a cyborg) laugh at the banter, while April and Splinter agree that all that really matters is that they’ve been friends ever since. 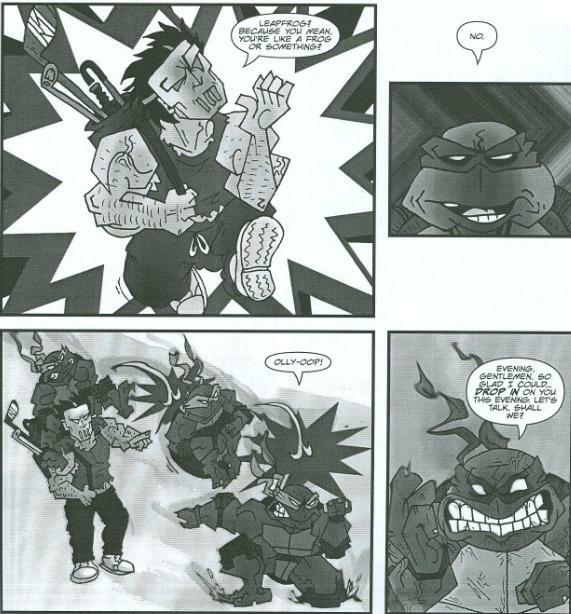 *The epilogue for this story takes place during the Image TMNT (Vol. 3) series. 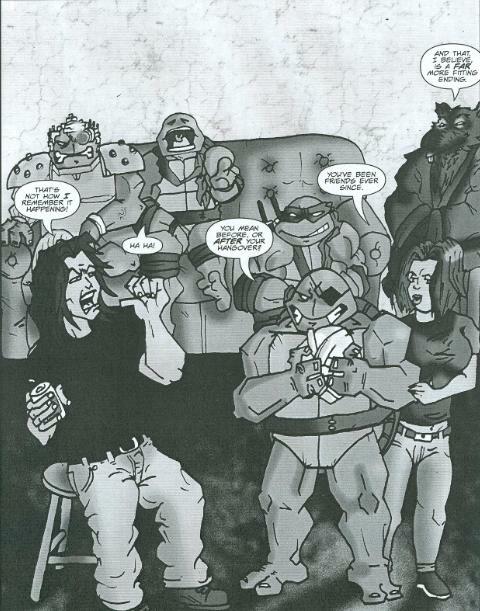 As all four Turtles, Casey and April are together, Raph still carries his Shredder helmet and Leo’s hands are not visible (so you can’t tell if he’s missing his left), I would place this part of the story in-between TMNT (Vol. 3) #16 and TMNT (Vol. 3) #17. *The story as Raph and Casey tell it takes place immediately after Raphael (microseries) #1. In fact, the first page of this story is a recreation of the last page of Raphael #1. *The other installments in Tupper's series of character vignettes are "Secret Spirit", "Credo", "Practical Jokes", "The Mother of All Anger" and "Fathers and Daughters". Will Tupper, who had previously done introspective back-up stories on each individual Turtle and Casey, now tackles the dynamic of Casey and Raph. It fits in nicely with Tupper’s other character-centric back-ups, focusing on the most popular duo in the book. Raphael (microseries) #1 ended on an “And the adventure continues…” sort of beat, leaving something of a story remaining to be told. Not to say it was an entirely necessary story, and as “Conflict Resolution” reveals, it was a fairly mundane “adventure” by their standards (beating down a pair of hapless purse-snatchers). But it was more what came after the thug-stomping that matters. At the point where we left Casey and Raph in Raphael #1, they’d come to an understanding but were still fairly untrusting of one-another. This story shows them parting on amicable terms and provides a nice link in their chain of friendship (lamest thing I’ve ever typed). The dialogue at the end felt a bit saccharine, but it was a pretty saccharine story in-itself, so far as stories about pummeling street urchins go. 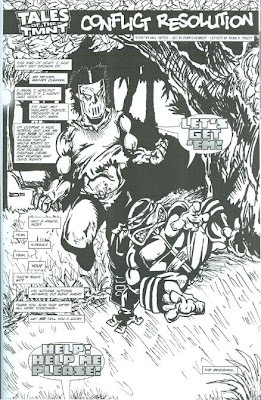 The reveal that it takes place during Image’s TMNT Vol. 3 felt a bit hollow. Whereas the timeframe of the storytelling fit the theme of Tupper’s other back-up, “Practical Jokes”, the theme of “Conflict Resolution” doesn’t really necessitate any particular time in Casey and Raph’s life. So I guess putting it in the middle of the Image series is as good a place as any, though it could really have gone anywhere. Dennis Kennedy’s artwork is a bit up and down with me. His recreation of the last page of Raphael #1 is very cool and at first glance I almost thought it was just a copy of the actual page. It wasn’t, though, with Kennedy doing a great job mimicking Eastman’s art style and changing the poses up a fraction enough to make it look like one pace from where Raphael #1 left off. His art style changes dramatically after the “frontispiece”, however, to a far more surreal and comical style. I didn’t mind the style so much, though some panels fair worse than others (the one on page 3 where Casey jokes about Leapfrog, for instance). The style fit the overall comedic tone of the story, as Casey hits the purse-snatchers with silly things like umbrellas and lacrosse nets while quoting “The Tick”. The digital photoshopped effects are too incongruous with the character artwork, though, and only serve to distract. At times I wasn’t even sure what was going on, such as the purse-snatcher swinging the purse above his head. Overall, I wouldn’t qualify this as the best of Tupper’s back-up strips but I enjoyed the miniscule gap in Casey and Raph’s “bromantic” bonding that it filled. Others may enjoy Kennedy’s art style more than I did, of course, and more power to em if they do.